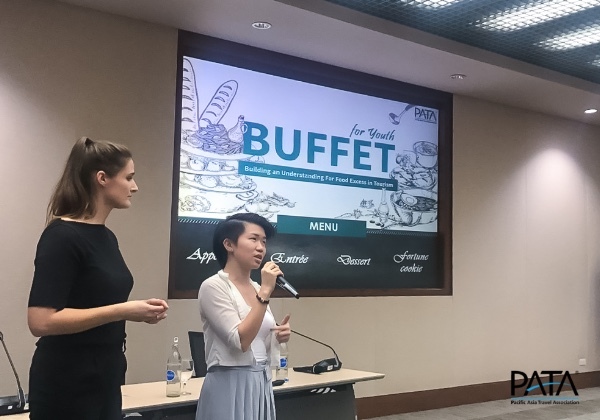 BANGKOK, Thailand, 2018-Mar-16 — /Travel PR News/ — The Pacific Asia Travel Association (PATA) is pleased to announce the launch of the “BUFFET for Youth”. The announcement was made yesterday by PATA Young Tourism Professional (YTP) Ambassador, Ms JC Wong, and PATA Sustainability and Social Responsibility Associate, Ms. Veronika Forstmeier, at the Asia Pacific Youth & Sustainable Tourism Workshop held today at the UN Building in Bangkok, Thailand. This entry was posted in Food & Drinks, Tourism, Travel, Travel Management, Travel Marketing and tagged food waste campaign, PATA, The Pacific Asia Travel Association, travel, “BUFFET for Youth”. Bookmark the permalink.